SHENZHEN, China, Nov. 17, 2018 /PRNewswire/ — On the afternoon of November 15th, the closing ceremony of the 2018 China Merchants Group “Building Blue Dreams – 21st Century Maritime Silk Road Training Program” (Referred as “C Blue Training Program”) was held at the China Merchants Port Building Shekou; 27 trainees from 11 countries along 4 continents successfully completed all the courses and honorably obtained diplomas. At the closing ceremony, the trainees received their first certificate in China. During this month, they not only gained professional knowledge, but also broadened their horizons. They visited many cities to experience the vitality of China’s economy and society and explore China’s developing strategies and now have a deeper, clearer understanding on their self-improvement and national development. On the morning of the same day, the “Belt and Road Innovation & Development Collaboration Forum” hosted by China Merchants Port and i Port was successfully held. The forum was divided into three main topics: keynote speech, forum discussion, and summary speech. 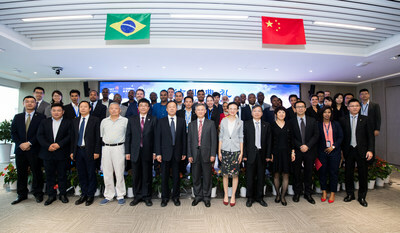 In the keynote speech, experts from the Ministry of Transport, Drury, Tianjin University, China Merchants Port and other organizations and C Blue trainees spoke about “whether the Chinese business model can be copied and used”, “in addition to construction funds, what do we need from China, and “we connect the world, from cooperation and friendship to build a better future”. 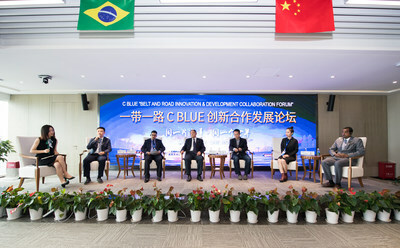 The success of the 2018 C Blue Training Program further enhanced the influence of China Merchants Group in the countries along the “Belt and Road” and better explained the corporate mission of China Merchants Port – “WE CONNECT THE WORLD”. At the same time, it has also deepened cooperation with Tianjin University. The success of the C Blue Belt and Road Innovation Development & Collaboration Forum puts forward the opportunities and challenges faced by China in the process of going global and effectively passes the “Chinese business card” to the trainees in the countries along the Belt and Road.